We interrupt our regularly scheduled “Balogs Eat Around the USA” weekly post for a Meal Delivery service critique. Last week we got an email coupon for 50% off our first Plated box. Well, you guys know how I feel about meal delivery services. Since I’ve tried a vast majority of the delivery services, I can honestly say that some are better than others. While it was the cheapest, I found Blue Apron to have WAYYYYYY too many steps and the end result often looked like my kitchen had blown up. Like seriously, I think most of the recipes used half my pans and cooking utensils. And salt—holy crap, so much salt. Hello Fresh was slightly easier, but still too involved and it took me forever to cook. If a recipe said 45 minutes, it was taking me well over an hour. Plus many of their ingredients showed up not so hello fresh. And at the time, they didn’t allow you a choice for the meals (I do believe that has changed, but that was definitely a nail in their coffin at the time—I’m trying to feed fussy kids here). Marley Spoon underwhelmed me so much that I can’t even remember the meals we had. I don’t think the family were fans at all. Home Chef was our favorite and we even stuck with it for a little bit. The meals were flavorful and we got to chose up to three meals a week. Their damning quality, however, was that they were the MOST expensive and provided the least amount of food. Maybe it seemed that way because it tasted the best—none of the meal plans at that point in time had taken a teenage boy into account. There should be a box to check for having a male going through puberty in your house. Maybe they’d actually send enough food then. So when Plated arrived, I was no stranger to the meal delivery world. It arrived around 10 am on Sunday with everything intact—that was definitely a plus in my book. The first meal we had was Crispy Chicken Sandwiches with Old Bay Aioli. A little labor intensive, but hubby and I worked together to prepare the meal. The good part was, it didn’t use a lot of dishes (Halleluiah!). The bad part was, while it tasted good, it didn’t seem to be worth the effort we put forth to make it. It only took about 35 minutes, so time-wise it was okay…just not what you want to commit to for chicken sandwiches. Also, hubby hated the buns. Unfortunately, the buns were also part of another one of our recipes. More on that later. We decided to rate this recipe a 5. Nothing terrible, but nothing special either. The next night, we had Cuban beef bowls. I was a little skeptical about this one. I wasn’t sure how the family would react to going out of their comfort zone and trying something completely different than I would normal make. Once again, hubby and I cooked together. It was totes adorbs. We should have been filming a commercial for Plated while we did this. 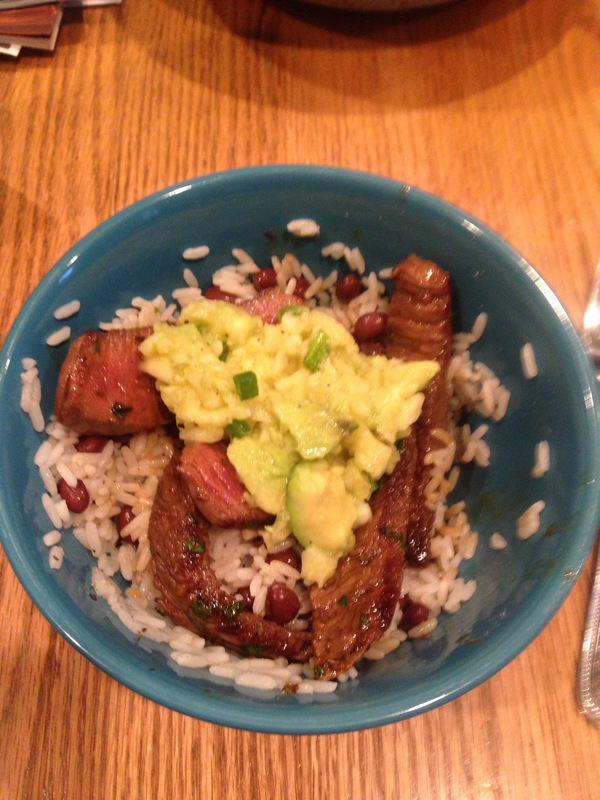 Hubby seared the meat and made the Mojo sauce while I was his helpful little sous chef and made the rice and the Avocado-Pineapple Salsa. It sounded like a weird combo, but it had my mouth singing. AMAZING dinner. Probably one of the best we’ve had of all the meals combined. Like seriously, I wanted to lick the bottom of my bowl. We gave it a 9—the only reason we didn’t give it a 10 was because the avocados arrived way overripe and we could only use one of them. After the beef bowls, I had real high hopes for Plated. I was actually starting to think we might order it more often. The recipes weren’t too time consuming, they didn’t use a lot of dishes, and they gave you more than enough food…especially the protein. My only thought at this time is that I might not want to order 4 meals every week. We had to have a Plated meal every day so they wouldn’t go bad and it didn’t leave any room for us to be spontaneous with our meals. Like order Chinese or something one night. We had to actually cook every night. Bummer. We then had the Chicken Avocado Burgers with Lemon Aioli and green beans. Hubby tapped out of this meal and I was left to cook it on my own. And that night, all my love for Plated ran screaming from the house. I was leery the second I removed the ground chicken from the package. I had never used ground chicken before and now that I made these burgers, I know why. After I molded them into burgers (they squished miserably between my fingers and actually looked like mounds of cat vomit), I had to sear them on the stove. I prayed none of my family members would enter the kitchen and see how disgusting they looked before they were cooked—I knew they wouldn’t eat them if they did. But no worries, even though they didn’t witness the cat vomit patties, they still wouldn’t eat the burgers. My hubby and son took a few bites (hubby complaining about the buns again and my son complaining they were tasteless and bland), but my daughter wouldn’t even touch the burgers. I swallowed as much as I could and choked down the green beans (I hate green beans, but I didn’t want to starve). So now we were 1 for 3. Okay, maybe 1 and a half for 3 considering the first meal was a 5 and that’s not really a failure, per se. The last meal was going to be the deciding factor. 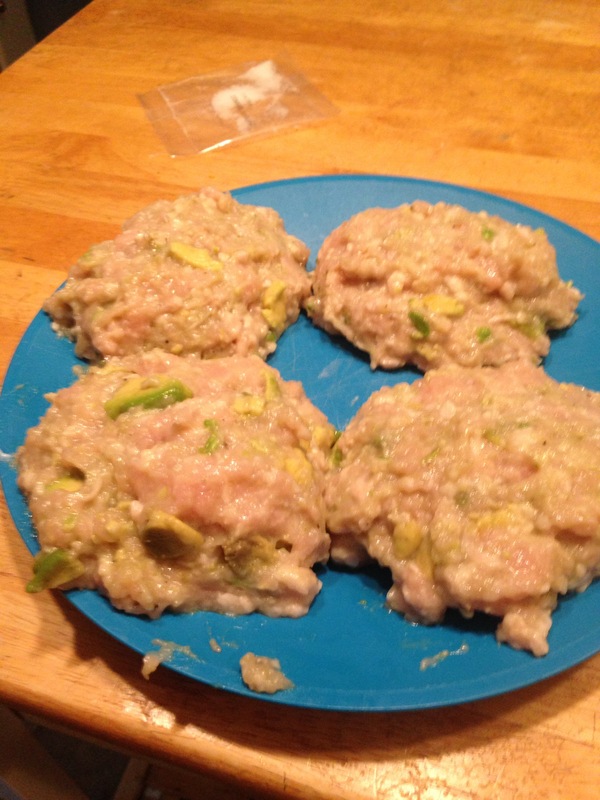 Hubs was on his own this time since I was still bitter about being the only person to have to experience the cat vomit patties. 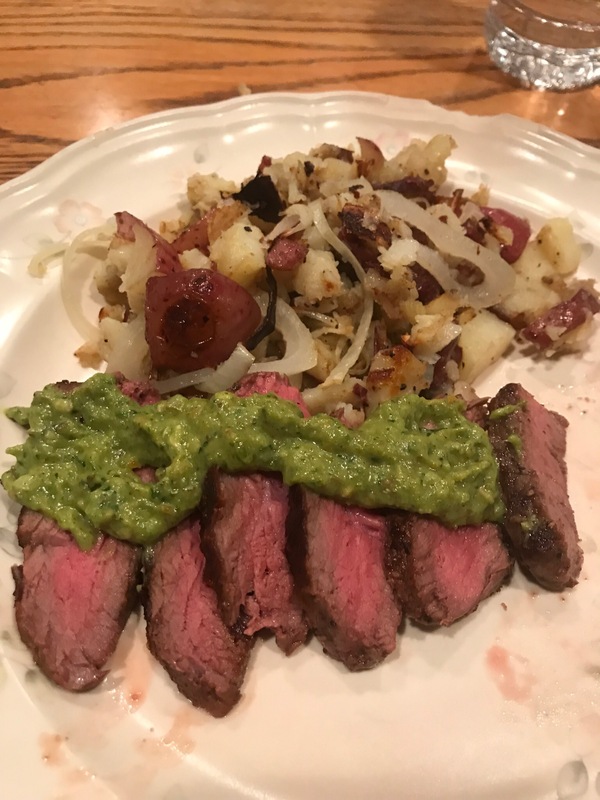 This was Seared Steak with Shishito Pepper Salsa and smashed potatoes. I usually defer to hubs for steak anyway. He’s much better than I am with it. I didn’t have any part of cooking since I had to run the teen all over God’s creation before dinner. When I walked into the house, though, it smelled fantastic. The peppers were so spicy I think my husband had tears in his eyes. However, once he blended them and made the salsa, they weren’t as spicy as we would have liked. This seems to be one of the problems with all the meal plans…we normally use a lot of spice, so the meals from the delivery services tend to taste bland to us. I understand that they need to cater to the masses, but there should be a “kick it up a notch” option (to borrow a phrase from Emeril). The steak tasted just as fabulous as it smelled and the potatoes were also delicious. Overall, the meal was really good and we gave it an 8. Will we try Plated again? Not sure—we will definitely need to chose the recipes more carefully, but I did like that we had a lot of options and choices for the meal plan, including as little as 2 meals a week, or as many as 7. It does take the guess work out of meal planning and cuts down my grocery store visits—I was only there three times last week instead of my usual six :). It was also fun to cook with the hubs, having the recipe printed out already. We shall see in the future, but I think this week, it’s time to resume our eating around the USA Challenge.